That's how Melissa McCarthy brought back her beloved impression of Press Secretary Sean Spicer to NBC's "Saturday Night Live" on Saturday night. 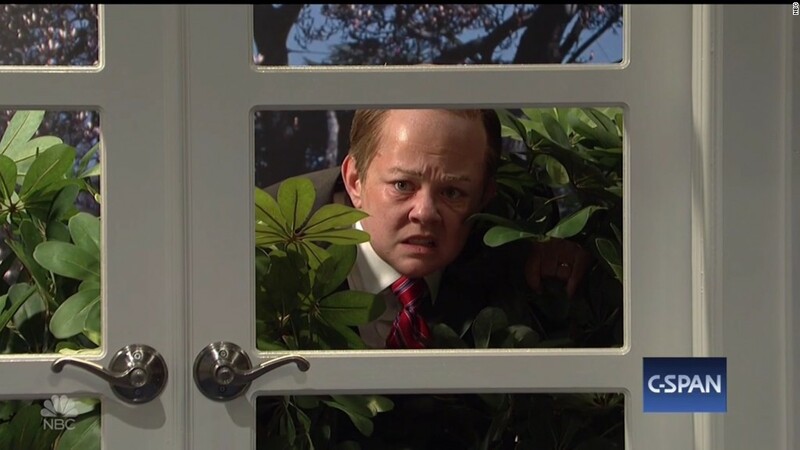 The actress, who was also this week's host, kicked off a sketch with Spicer in the bushes outside the White House before taking back the lectern from Aidy Bryant's Deputy Press Secretary Sarah Huckabee Sanders. McCarthy's Spicer took questions from the White House press about President Donald Trump's firing of FBI Chief James Comey, as well as Russia. "Let me just put this whole Russian thing to bed once and for all, Trump is innocent," McCarthy's press secretary said. "How do we know? Because he told us so. Period." The sketch included "Spicer" attacking reporters with fire extinguishers and even structures of the White House itself before the reporters asked if Trump is lying to Spicer. "He wouldn't do that," McCarthy's Spicer said. "He's my friend!" One reporter then asked Spicer that if Trump is such a good friend, why is everyone saying that Trump is about to replace Spicer with Sanders? To find out, McCarthy's dismayed Spicer took his moving lectern to the streets of New York to speak with Trump. Unfortunately, Trump was at "a golf course in New Jersey." "Have you ever told me to say things that aren't true?" McCarthy's Spicer asked Trump, played by Alec Baldwin. "Only since you started working here," Baldwin's Trump responded. Spicer then told Trump he couldn't do this anymore, which led the President to say how much he cares about Spicer and even request a kiss. "Yes," Baldwin's Trump responded before going in for a long, deep kiss. That wasn't the only sketch for Baldwin's Trump. 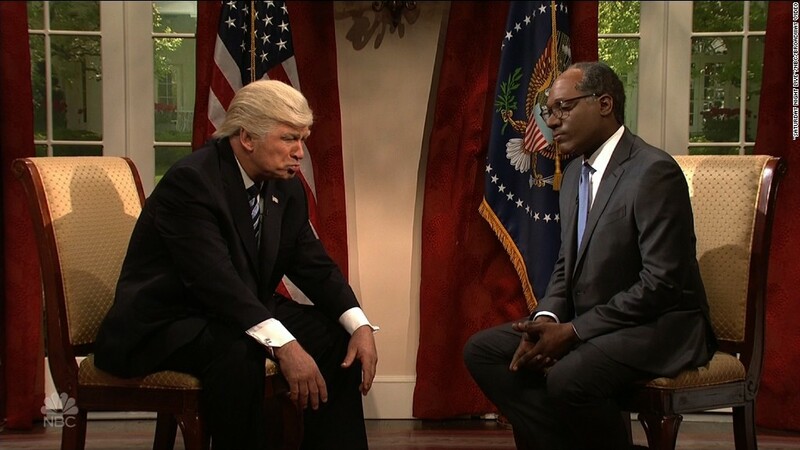 The faux President also opened the show in an interview with NBC anchor Lester Holt, who was played by Michael Che. Che's Holt asked "Trump" about how some had drawn comparisons between Trump and Richard Nixon this week. "No, no, no, I am nothing like Nixon ... I bet Nixon only got one scoop of ice cream for dessert. But I get two scoops, OK? Two scoops," Baldwin's Trump said, holding two fingers up on each hand in the air, reminiscent of Nixon's iconic pose.